It’s 2018. Search engines are plentiful and free-of-charge across the Internet. From Google, to Amazon to your ecommerce site, shoppers have multiple options where they can easily seek information, compare products, and make purchase decisions. The reality is that search, while free, varies broadly in quality and usability. Google, with the help of ground-breaking advancements in natural language processing and machine learning, has all but transformed search from a human endeavor focused on finding relevant results into a data science application fueled by big data and machine learning. Legacy search systems that still rely on basic keyword approaches make shoppers work a lot harder—in most cases, too hard. Subpar search drives shoppers to research products on Google, where they could be directed to a competitor’s site to complete a purchase. Improving on-site search starts with merchants embracing the same high expectations of search that shoppers have. 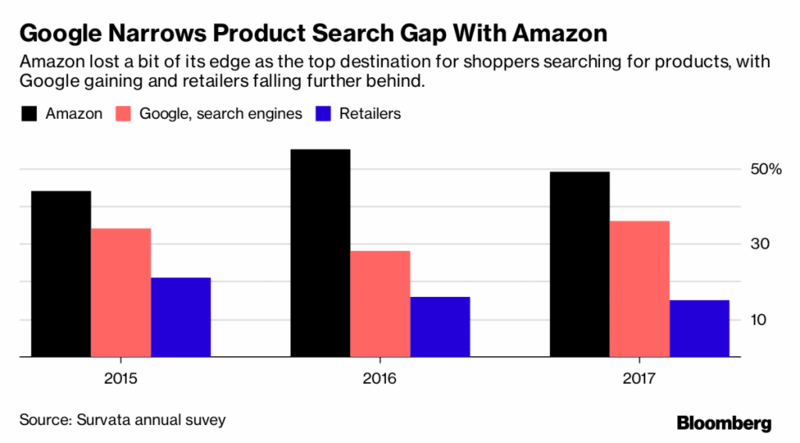 Source: Bloomberg: Google narrows product search gap with Amazon, December 20, 2017. The chart above shows that in the most recent three years, the number one place where shoppers start product searches is at ecommerce behemoth Amazon. Amazon’s leadership is being challenged by search behemoth Google. And web retailers as a segment are lagging the larger firms. This chart should be a wake-up call for web retailers: if it’s easier to search for products on Google (or Bing or Amazon) than on your site, your loyal customers will turn elsewhere to start their buying processes. Natural language processing (NLP) enables search engines to move from presenting results that simply match query keywords, to presenting results that match on query intent. Consumers always prefer high quality results from search on the first try, regardless of phrasing, typos and grammar. If search returns irrelevant results because of a misspelled word or a synonym, users don’t think they messed up—they think you just don’t have what they’re looking for and they go elsewhere. Natural language processing matches customer intent even when the shopper’s query has typos. And while many ecommerce teams employ search optimization experts who’ve painstakingly added synonyms, typos and brand names to their keyword search engines, improvements are modest. Dramatic improvements in search accuracy don’t come from adding manual bandaids. It requires a fresh approach using NLP and learning from large datasets. NLP helps understand customer intent to find the best set of products, but that set of products can be huge. Additional processing is required to present the results to the customer in the rank order most likely to lead to a purchase. The legacy approach to results ranking is semantic relevance and algorithms like TF-IDF: exact keyword matches rank first weighted by how “important” a keyword seems using something like TF-IDF or BM25. Relevance scoring uses things like word count and proximity heuristics to rank results. Merchandising staff is then tasked with manually overriding cases where the automatic relevance goes terribly wrong, guessing at user intent with little information on actual conversion outcomes. Constructor believes that business strategy, not your search vendor’s out-of-the-box algorithm, should determine the ranking strategy. Conversion rate, gross margin, customer loyalty, recent search terms, or a utility function comprising multiple values makes the search experience more valuable to customers and the business alike. And machine learning should automate ranking improvement efforts through continuous analysis of every query, every transaction, every abandoned cart, and every relevant buyer characteristic to achieve the desired business outcomes. Personalization is an extreme form of results re-ranking based on the characteristics of a single user. Like results ranking described above, big data and machine learning are essential to performing personalization at scale. Shoppers and merchants have always valued personalized experiences, but web scale personalization is relatively new. What this means is that sites that offer recommendations and personalization are better equipped to drive customer loyalty and revenue. For example, a shopper searching for “blanket” in the winter in New York benefits from seeing a different set of recommendations than a shopper running that same search during the summer in Sydney. Likewise, a shopper who repeatedly purchases organic products on your site should see organic selections as part of future search results. Mobile shoppers especially value personalization because precise results mean they succeed with fewer taps on their small screen phones. 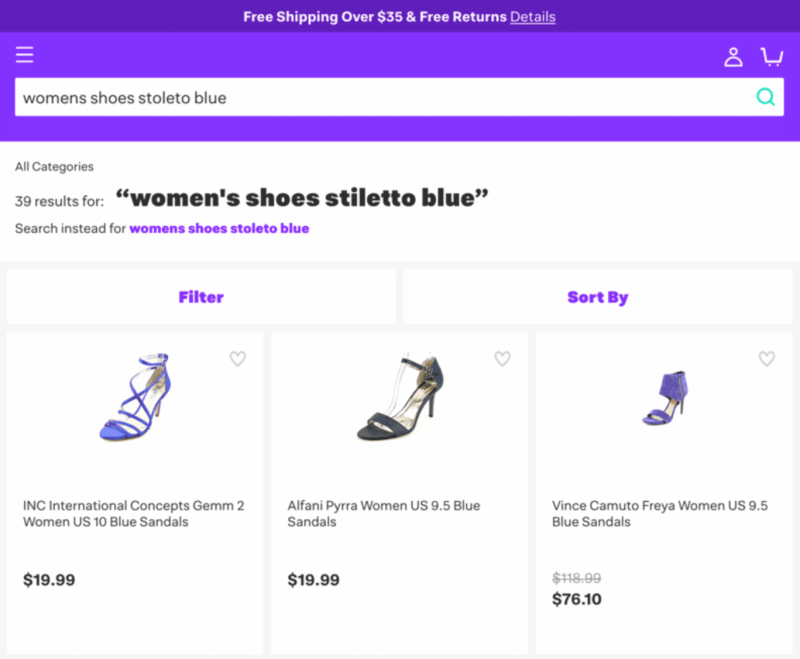 Natural language processing, machine-learning driven re-ranking, and personalization enable you to match the shopping experience of the best search engines. Integrating these technologies with your merchandising programs and expertise allows you to beat your competitors. Merchant controls enable the commerce team to take proactive steps to supplement machine learning algorithms. Examples include new product introductions, inventory clearance priorities, or seasonal shopping collections. It also allows merchants to generate incremental revenue from suppliers willing to purchase premium placements to gain visibility with targeted shoppers. The end results of coordinating merchandising programs with machine learning algorithms include happier customers, more effective merchandising programs that require less manual intervention to implement, business efficiencies, and improved margins. Start a conversation on the Constructor web site or via email. Request a demonstration of Constructor search and autosuggest solutions. 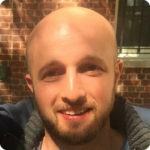 In the process you’ll learn how to drive double digit revenue lift from search in just a few weeks. Encourage your entire team to learn more. Share this blog post and subscribe to our email list. 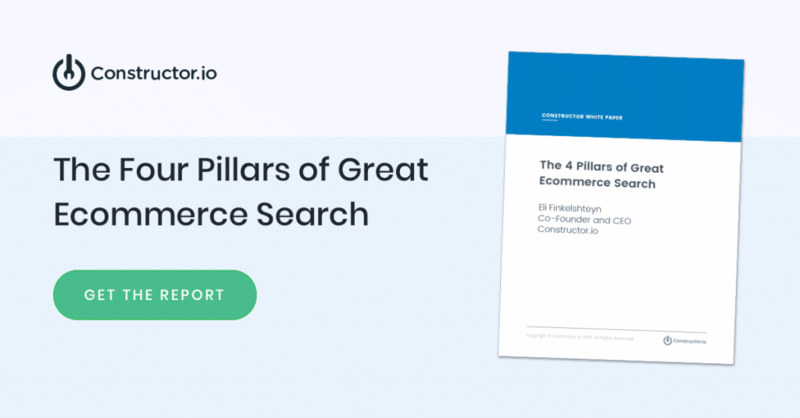 We will share a lot of helpful information for ecommerce and engineering leaders who are excited about the future of search. Expect more from on-site search. Get more from on-site search with Constructor. Eli Finkelshteyn is the co-founder and CEO of Constructor. Previously he worked on data science at Tumblr, Shutterstock, and Backplane.